The weekend of Nov. 8 brought about the ninth annual Metro Cooking DC, a cooking and entertaining show that takes place every year around the same time—just in time to help with the holidays for entertaining inspiration and the opportunity to pick up some unique gifts for family and friends. The show hosted an estimated 18,000 attendees over the weekend and with a cost of just $20 to attend the show, it’s no mystery why; it’s a steal of a deal! But like every show, there are ad-ons available. Entertaining Workshop Area, James Beard cooking demos, the exhibitor marketplace which featured more than 300 vendors selling specialty food and other related products. favorite, was $59.50 for 35 tickets to use to sample food from over 40 different local chefs and restaurants. The best part? All of the above add- ons included the general admission ticket in them. A show like this would not have been complete without some spirits though, so for an additional $24 attendees could have visted the beer, wine, and spirits pavilion, or for an additional $55-120, they could have attended private cooking classes learning knife skills, how to make holiday hors d’ oeuvres, or fondant cake decorating. 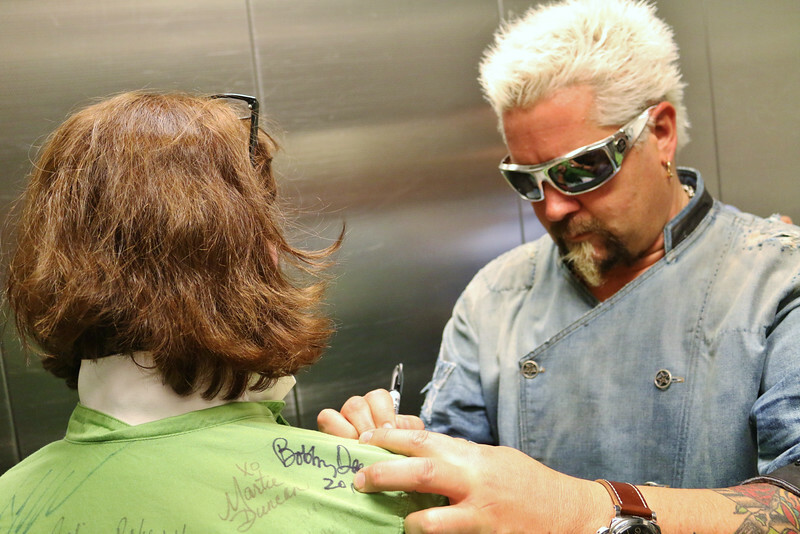 Saturday, Nov. 8 brought Guy Fieri to the celebrity stage entertaining guests with his normal Fieri flare. 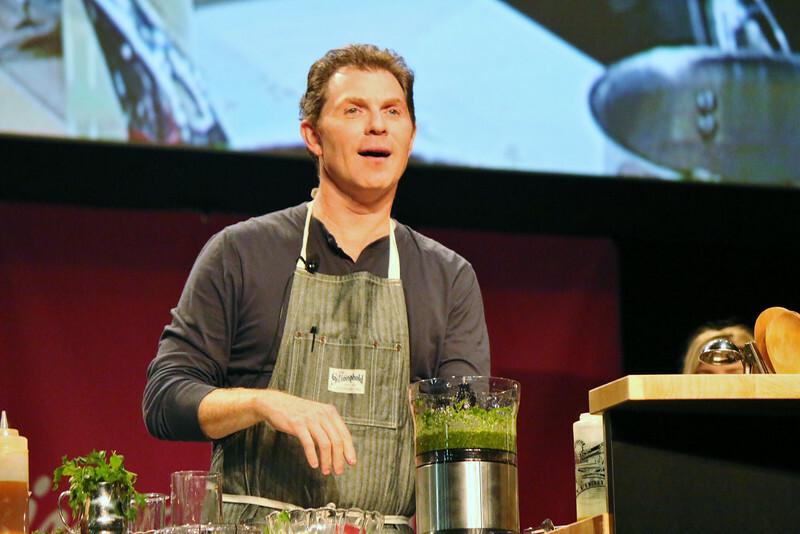 Sunday, Nov. 9, Bobby Flay came to the same stage, demonstrating to onlookers how to make a red wine sangria, a pan roasted chicken with chimichurri sauce, and a vegetable paella. The Marketplace is where exhibitor’s set up in droves to expose the masses to their unique wares and services. Almost everyone had something to sell on the spot, whether that be chocolates from local Baltimore Parfections, or Flavor Bombs’ (www.flavorbombs. com) creator Gio from New Jersey. Vendors came from around the country with the hopes of making some extra holiday money and offer attendees special show specials; whether it be skincare products, hand-crafted aprons, or flavored olive oils and balsamic vinegars. For an upcharge, attendees could purchase 35 tickets to use in the tasting pavilion. It cost one ticket for each vendor’s item, with over 50 items to choose from over 40 different local DC chefs and restarants. Vendors ranged from high-end chain locations like Dean & Deluca and Blackfinn to local favorite spots like Food Wine & Co. and Sweet Teensy bakery. Vendors were not providing bite or two-bite tastings, but rather hearty portions that not only filled attendees up, but also left many in a food coma state. Slightly disconnected from the rest of the show was the beer, wine, and spirits pavilion, which offered roughly 50 varieties for those who purchased a ticket for that portion to enjoy. The wines ranged from stateside to international wines, but disappointingly, there weren’t any local wines. The alcohol was only there for tasting and could not be purchased, making for a serious disconnect with the rest of the show, which was either local or available for purchase. There were a variety of approximately 15 craft beers available as well. A. Smith Bowman Distillery was on hand to serve up their delicious bourbon and gin, and Anestasia Vodka was also serving their smooth vodka that’s made in Oregon, but available in Maryland and DC through a local distributor. ~SPAGnVOLA Chocolatier (www. spagnvola.com) for their local hand- crafted truffles made with chocolate from the Dominican Republic. They offer free weekend tours of their factory located in Gaithersburg, MD. Floriana brought their “A” game with their gnocchi bolognese. Osteria Marzano served these not-so-bite-sized-yet-scrumptious short rib ravioli. Food Wine & Co.’s second dish, the celery root vichyssoise, was also amazing. One local DC restaurant’s wagyu brisket slider was a huge hit. Rillettes were all the rage this season and Room 11 did not disappoint with their house-smoked trout rendition. Smith & Wollensky brought some of their best with options: steak tartare and beef carpaccio. They wouldn’t let you go thirsty either; A. Scott Bowman brought their best Virginian spirits. I cannot tell a lie, I did indulge… a few times. Dean & Deluca’s chile lime marinated shrimp was also a hit. As a member of the press, of course I had to stop and try The National Press Club’s calamari cakes and boy were they tasty.